Mike and I were talking about adding a small deck off of the french door last week, but don't have any money in the budget for extras right now. Wouldn't you know, while driving through town, we found a commercial air conditioning pallet next to a dumpster. I really didn't know what it was at the time, but couldn't believe anyone would throw out such good, usable wood. I stopped to ask the owners if we could take it, if they were indeed throwing it out, and after looking at me strange, they said yes, as long as I took it all! Ummm, ok. 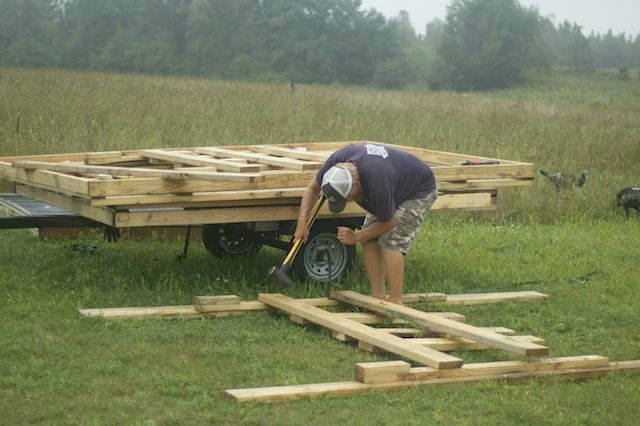 There were four panels made from brand new treated 2x4's, 2x6's and 2x8's, most about 6 or 8 feet long. * Three hours of our time to dismantle the boards and remove the nails. We have more than enough lumber to build our deck and some of the nails are even reusable for other projects!